When it comes to business travel, it’s important to make sure your belongings are safe and secure in the right kind of luggage. Between thieves, getting tossed around on the road, and carrying everything you need, the suitcase you choose to use is important! With so many options available though, how will you know what’s right for you? Don’t fear, we’re here to help! Read on for more information about our top 5 picks for the best carry-on suitcase for business travel! In a hurry? 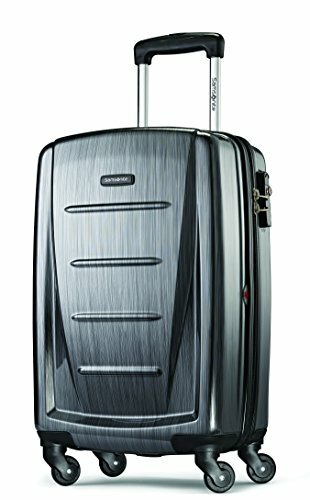 Check out our top pick, the Samsonite Omni PC Hardside Spinner, over on Amazon now. 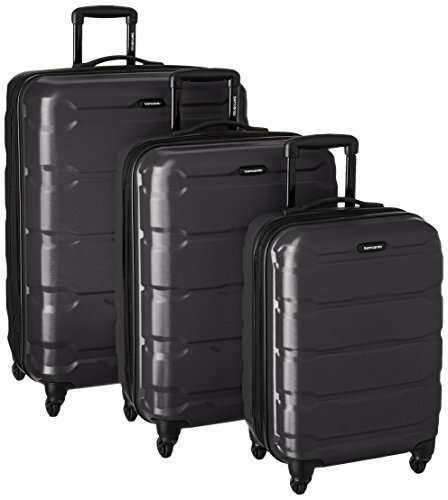 The Samsonite Omni PC Hardside Spinner 20 is one of Samsonite’s best-selling carry-ons – for good reason! Measuring at 9.5 x 14.5 x 19”, it’s small enough to bring on the airplane with you as a carry-on while still large enough to fit all of your business essentials! The Hardside Spinner features a divider and cross straps for security and increased packing organization. This carry-on really shines with the quality of materials used in its construction. Featuring a micro-diamond texture that is extremely scratch resistant, you won’t have to worry about your luggage getting dinged up or smashed while on the road. Theft is also now a thing of the past. The micro-diamond is sturdy and if that’s not enough to deter thieves, the built-in TSA combination lock should be! Couple that with a sturdy retractable handle and the lightweight 360-degree spinner wheels make traveling with your luggage a breeze! You can check out more info and all the different colors this comes in over on Amazon now! TravelPro has been a stable in the luggage sector for a while now and for good reason. The TravelPro Luggage Crew 11 is made of a high-quality ballistic nylon and has a stain and scratch resistant DuraGuard coating. If this doesn’t sound durable enough for you, the zipper heads are SUPRA damage resistant and the top and side handles are made of reinforced leather. Although we doubt you’ll need it, the Luggage Crew also comes with a limited lifetime warranty. 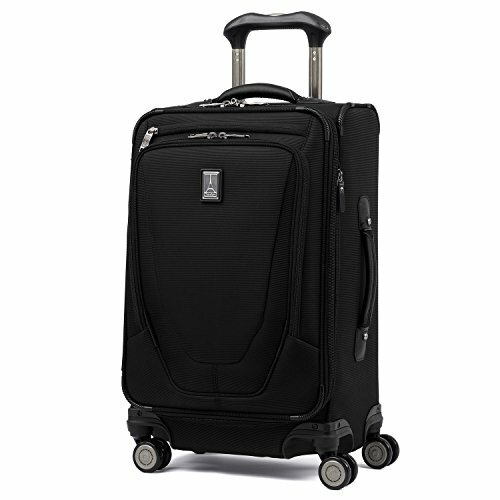 The Luggage Crew has a telescopic handle and 8 self-aligning magnetic 360-degree dual spinners, making navigating busy airports and crowded streets a breeze. An added neat little feature is the external USB port which makes charging devices from the charger pocket easy while on the go. The Luggage Crew also offers several interior pockets as well as an exterior pocket, so you don’t have to worry about opening up your entire suitcase when you need to look for something. Ready to get flying? You can get this professional-level carry-on for yourself over on Amazon by clicking here! Think of the Samsonite Winfield 2 as the Hardside Spinner’s more handsome cousin. The Winfield 2 features a beautiful brushed pattern that is designed to hide any scratches or scuffs you might get while traveling. The overall dimensions are 23 x 14.5 x 9.5”, making it larger than the Hardside Spinner, but still suitable as a carry-on. The Winfield 2 can carry up to a week’s worth of clothes easily and features a full zip interior divider with pockets and cross straps, making it easy to keep your gear organized. The exterior is built strong to withstand the scuffs and dings of travel. The polycarbonate exterior is made to absorb impact and pop right back into place, meaning you won’t have to worry about your suitcase getting dented. In addition, the Winfield 2 also features a telescopic locking handle, side and top handles, and a TSA compatible combination lock. You can check out the huge variety of styles for this luggage and buy one for yourself over on Amazon by clicking here. The carry-on of the future? 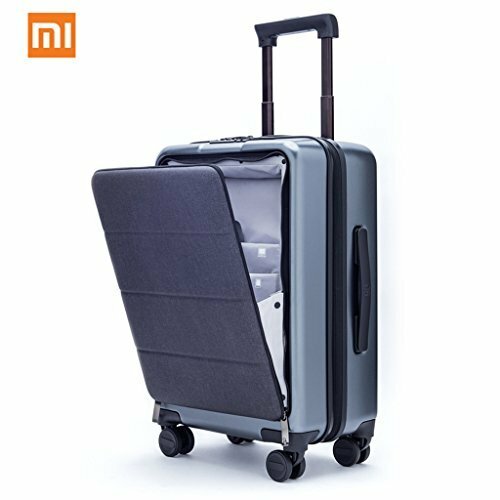 The Xiaomi Carry On takes carry-on suitcases to a whole new level. The innovative easy access front pocket features a padded sleeve for laptops up to 15 inches, a sleeve for your tablet, a sleeve to keep them secure, and 7 pockets for organized storage! This makes accessing your items on the go a piece of cake and is one the main selling points of the Xiaomi Carry On. The exterior of the Xiaomi Carry On features premium materials. The outer shell is 100% polycarbonate, meaning that it is scratch and dent resistant. The front fabric cover is also made of waterproof 650D Oxford fabric, so you know your luggage is safe! The Carry On also features a telescopic gel handle, silent 360-degree omnidirectional spinner wheels, and a built-in TSA compatible combination lock. Want to know more? Check out this awesome tech-friendly bag over on Amazon by clicking here. For those of you looking for a weekend style bag, the Baosha Canvas PU Leather Travel Tote is a high-quality, affordable option. The body is made of durable canvas while the bottom and the handles are made of PU leather, making this a good option for a weekend or 3-day trip where a carry-on with wheels might not be suitable for the environment. The Baosha Leather Travel Tote is modeled after the classic oversized military duffel, so it’s quite spacious. Packing for two people for the weekend shouldn’t be a problem and it even has the added benefit of an interior pocket, something that’s rare among duffel bags. 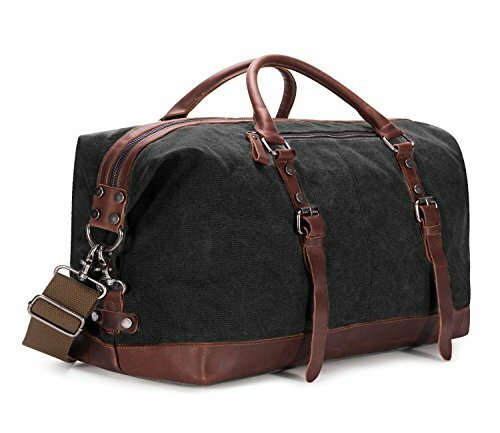 You can check out this affordable weekender bag over on Amazon right now to buy for yourself. There you have it, our top 5 picks for best carry-on suitcases for business travel! Have you used any of the suitcases on the list? Leave a comment and let us know how you liked it!